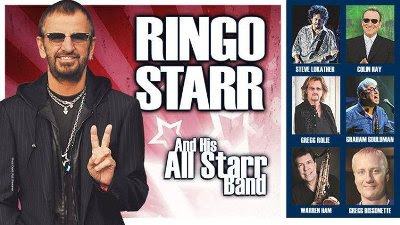 Ringo Starr has unveiled new dates for his latest tour with a revamped All Starr Band. The lineup for the band regularly changed between 1989 and 2011 before Ringo locked in a group of musicians for a five year run. Returning from that band are Steve Lukather (Toto, guitar), Gregg Rollie (Santana, Journey, keyboards), Gregg Bissonette (drums) and Warren Ham (sax, flute, percussion). Not joining for the latest tour are Todd Rundgren, Richard Page and Mark Rivera. New or returning from earlier versions of the band are Colin Hay (Men at Work, guitar) and Graham Gouldman (10cc, bass). Ringo said of the tour "There is no greater joy for me than playing great music with great musicians. Every night we get to play for all those loving people and it makes the hassle of touring worth it. It is a Peace & Love fest and I can't wait to see you all out there this summer and fall." Starr has a series of dates in Europe during June and July before coming to North America.